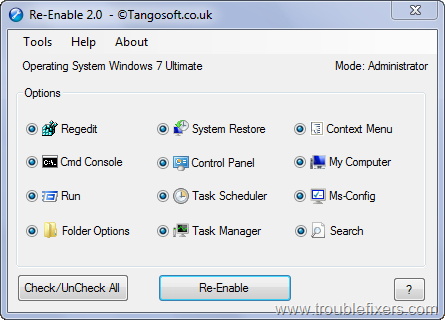 The name of this tool tells it all, it will enable all the features which were lost, like it will enable the option for your task manager, it will enable the folder options and many more similar features. Do keep an important point in your mind before using this that there should not be any virus in your system, while you are running it on your system. It will not recover those features which were disabled by the virus which is currently running on your system. You must have Microsoft .net Framework to use it, else the total downloadingsize of the complete package will be of around 23 Mb. But if you have the Microsoft .net Framework installed then the downloadable setup size for you system will be below 800Kb. As mentioned that the size of this setup is very small (with complete requirements), so it will not take much time to get installed and this tool is also portable. Besides these features, it can delete the autorun file present in your system, it can also repair the desktop, it can repair the startup problems (when your explorer.exe starts), it can also show you the drives which are hidden in your system and there are more such features that can be performed. All these features are available under the ‘Tool’ option of that tool. As soon as you launch this tool, it will show the operating system which is being used and it will also show the mode of the user account in which you are working. This tool has been found to be compatible with all the versions of Windows as it has been checked with Windows 7 32-bit Ultimate edition.